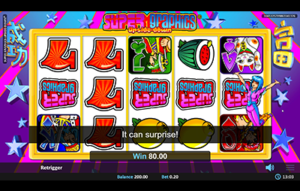 Realistic Games’ most popular online slot machine gets an HTML5 reboot. Many moons ago, a small software company called Realistic Games was founded in Berkshire England. With a focus on the digital interactive games market, the company spent the first few years compiling other creator’s games onto a single platform, then leasing them to major UK gaming operators; Bet365, BetFred, Ladbrokes, Stan James, SportingBet, etc. Their decision to develop digital content in-house was a game changer; highlighted by the fabrication of a rare gem they called the Super Graphics Upside Down Slot. That game hit the market in September of 2011 and became an instant success. With a Japanese anime theme and one of the most mind-boggling free spin features to date. It was just disorienting enough to convince players that they were receiving great rewards during each “free revolution of 15” spins; thus skyrocketing the game to number one position on the Realistic Games menu. In reality, there is no difference whatsoever from the original game once free spins are active. And yet, the game’s pay table proclaims they offer “different (and more generous!) win combinations”. How can they claim this if there’s no change? By flipping the 5×3 reel grid upside down, the pay lines change their alignment. The actual number of lines do not change, but this does technically make them “different…win combinations”. As for being “more generous”, the only difference is that players aren’t having to pay for the spins. If any amount is won, the payout is 100%; as opposed to 100% minus total bet per spin. But alas, so long as players are enjoying the experience, who’s to dispute the game’s generosity? The fact is, players loved it then, and they love it now. Realistic Games sent their design crew back to the lab to recreate their most popular gambling game. The designers did a fantastic job, upgrading the game to HTML5 optimization. It now exhibits sharper imagery with more vibrant colors and streaming animations to create a more immersive experience. Moreover, the game’s anime host, Satsuki, is livelier than ever. 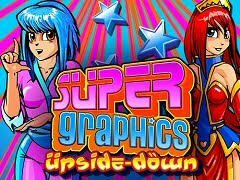 As you know, the original Super Graphics Upside Down Slot was launched in 2011. Realistic Games also created a 3-reel version called Super Graphics Super Lucky. This latest release doesn’t count as a new addition to the series; rather a more attractive, mobile compliant replacement of the original. However, Mr. Lee let the cat out of the bag, so to speak, on a third addition to the brand’s most popular online slot machine series.